This stylish new backpack comes complete with a padded laptop sleeve (holds laptops up to size 10"x14"x20"), two interior expanding file pockets, padded back and ergonomic straps with cell phone sleeve. 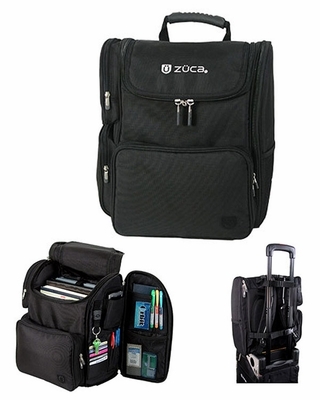 Also includes a side zippered office organization pocket and a portal for your ipod. It has a PDA/smartphone pocket, and is the perfect companion for the ZÜCA Pro and ZÜCA Sport. This sweet bag stands tall on its own when fully loaded.